Using a spiralizer with a shredder blade, or a mandolin fitted with a julienne blade, cut the zucchini into long spaghetti-like strips. If using a spiralizer, use kitchen scissors to cut the strands into pieces that are about 8 inches long, this makes it much easier to eat! In a small bowl, whisk together soy sauce, balsamic, hoisin, water, red chili paste, sugar and corn starch. Set aside. Season chicken with salt and pepper, to taste. Heat oil in a large deep nonstick pan or work over medium-high heat. Add the chicken and cook until browned and cooked through, about 4 to 5 minutes. Set aside. Reduce heat to medium, add sesame oil, garlic and ginger to the skillet and cook until fragrant, about 30 seconds. Add the bell pepper, stir in soy sauce mixture and bring to a boil; reduce heat and simmer until thicken and bubbling, about 1-2 minutes. Stir in zucchini noodles and cook, mixing for about two minutes or until just tender and mixed with the sauce. Zucchini will release moisture which helps create a sauce. Once cooked, mix in chicken and divide between. 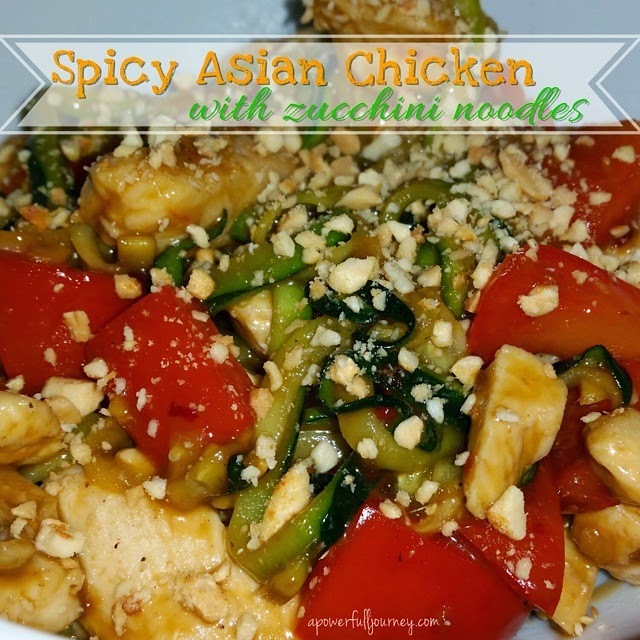 Top with optional peanuts and scallions, and ENJOY!